During the September 20 session, the TPiE suspended parliamentary rules to permit members to speak without time limits, in which numerous members criticized Karma Chophel’s remarks for hurting the feelings of His Holiness. Karma Chophel denied he said anything that would cause His Holiness to be hurt, and prior to the September 20 session, Karma Choephel had even written a private letter of apology to His Holiness and pledged to never express his views about this issue again. The TPiE ultimately passed a resolution that 1) asked His Holiness to live to 113 and beyond, 2) pledged the TGiE would confront such issues in the future without hesitation, and 3) pledging to fulfill the Dalai Lama’s aspirations with democratic polity endowed by His Holiness, according to a Tibet Sun article. This means that the TPiE engaged in an entire session attacking Karma Chophel for supposedly shortening the lifespan of the Dalai Lama, when it turns out that the original interpretation of what His Holiness had said was untrue. Article 19 of the Universal Declaration of Human Rights guarantees freedom of expression and opinion for all people. Freedom of speech is also protected in the Charter of Tibetans in Exile. His Holiness has said “[t]ruth is the best guarantor and the real foundation of freedom and democracy.”<FN4> In any democracy, it is important that people be allowed to comment on and criticize the political decisions and policies of their leaders. A democratic government needs to tolerate such speech, especially so if the government disagrees with such speech. Otherwise, a government’s stated commitment to free speech is just empty words. The CTA document emphasized that His Holiness “has never said all should agree with his line of thought.” Apparently, the TPiE forgot these admonitions in their September 20 session. 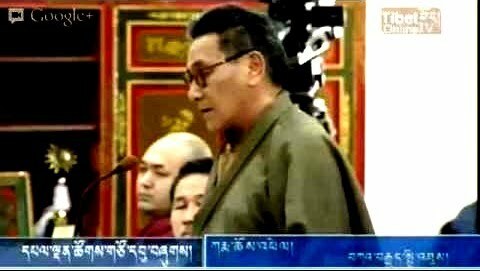 Perhaps coincidentally, one day before on September 19, Sikyong Sangay criticized those who “make baseless and unrealistic criticism” and warned that his administration “will not hesitate and spare no efforts in dealing with such criticisms in its pursuit of Middle-Way Approach and those who denigrate and misconstrue His Holiness the Dalai Lama.”<FN6> This statement -- like the TPiE resolution the following day -- carries an implicit threat against critics, and attempts to improperly link criticism of the Middle Way Policy with disloyalty to His Holiness. That is unfortunate. Factually, too, it bears pointing out that His Holiness composed the Words of Truth Prayer in 1960, more than a quarter-century before the Middle Way was put forth. At the time, the objective truth was that independence was probably in every Tibetan’s heart. For example, His Holiness’s March 10 address in 1969 declared: “Even if the Chinese leave nothing but ashes in our sacred land, Tibet will rise from these ashes as a free country even if it takes a long time to do so. No imperialist power has succeeded for all time to keep other people in colonial subjection for so long.”<FN7> Pointing this out does not detract from those who now genuinely believe in the Middle Way Policy. The TPiE lashed out against MP Karma Chophel for his remarks about His Holiness and the issue of Tibetan independence. In other words, Karma Chophel was publicly lambasted for his views without any credible basis, evidence, or investigation. This kind of behavior is reminiscent of anti-democratic systems where public attack, shaming, and self-criticism are used to ensure ideological orthodoxy. Such behavior does not speak well of the development of Tibetan democracy in exile. In addition, the TPiE’s actions have caused a chilling effect on free speech in the Tibetan exile community. On September 30, 2013, Gu Chu Sum, an organization of former Tibetan political prisoners, named for the months that saw massive pro-independence demonstrations in Lhasa in the 1980s, suddenly changed its formal position from independence to the Middle Way.<FN8> This change by Gu Chu Sum appears to be an attempt to deflect attacks against them for their prior support for Tibetan independence. This appears to be fallout from the growing free speech problems culminating in the TPiE’s September 20 session verbally attacking Karma Chophel. It was improper for the TPiE to attack an MP for his personal opinions in the manner that they did. It is unacceptable that the TPiE used His Holiness’ name to attack Karma Chophel, particularly without a thorough investigation into the facts. The TPiE’s actions are a step backwards for Tibetan democracy in exile and free speech. They have caused some Tibetans in the exile community to be extremely reticent in expressing any criticism of the CTA’s policies for fear that others will paint them as anti-Dalai Lama. Clearly, His Holiness has a high regard for democracy and free speech and the TPiE’s actions on September 20 are in direct contravention of such ideals.